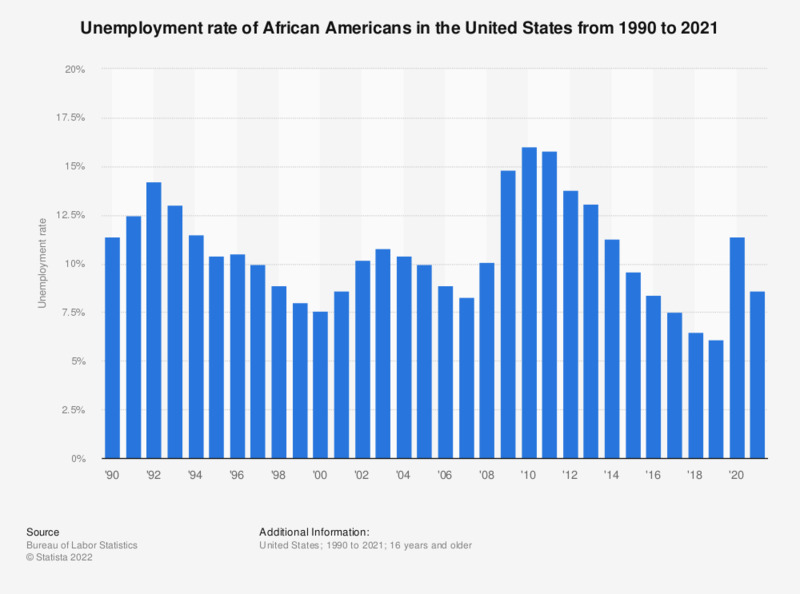 In 2018, the unemployment rate of African Americans in the United States stood at 6.5 percent. This was about 1.6 times the national average of 3.9 percent. There are many reasons why the unemployment rate among minorities is different than the national average. When it comes to African Americans, a large part of this is due to historical events, such as slavery and the struggle for civil rights, as well as the number of black families living below the poverty level. Additionally, in 2016, for every 100,000 of the population, there were 2,415 black men in prison. This high rate of imprisonment can contribute to the unemployment rate for African Americans, since having been in prison can reduce one’s chances of finding a job once released. African Americans also make less money than other ethnicities in the United States. In 2017, the median weekly earnings of African Americans were 682 U.S. dollars, compared Asians, who made 1,043 U.S. dollars per week, and whites, who made 890 U.S. dollars per week. While the African American unemployment rate may be the lowest it has ever been, it is clear that much has to change in order to achieve full equality.